Savy Nistala dances with her group, COMOtion, during India Day on Saturday in Jesse Wrench Auditorium at Memorial Student Union. The event was hosted by the Cultural Association of India, a student organization at MU esta blished in 1957. Iswardavi Hans watches dance performances during the India Day celebration held Saturday in Jesse Wrench Auditorium in Memorial Student Union. Hans attended the event with her son and daughter-in-law. Lavanya Ashri waves the Indian Flag on Saturday during India Day in Jesse Wrench Auditorium at Memorial Student Union. Ashriâs dance group, COMOtion, performed a patriotic Bollywood dance for the event, which was hosted by the Cultural Association of India. 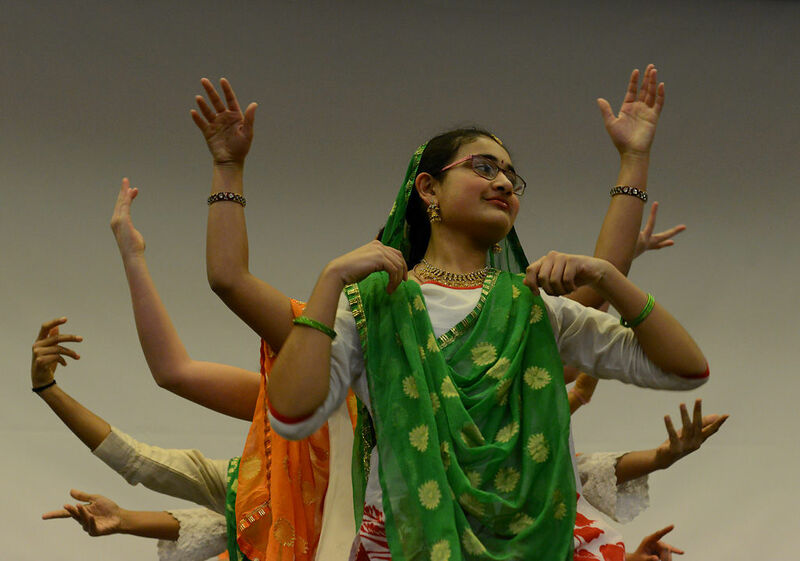 Mansi Patel dances during India Day on Saturday in Jesse Wrench Auditorium in Memorial Student Union. It was the day after the holiday, but Ajay Vinze, dean of MUâs College of Business, began his speech by wishing the crowd a happy Republic Day. âI tâs always a wonderful time to stop, reflect and rejoice,â he said. Vinze was the first speaker at the third annual India Day celebration organized by the Cultural Association of India, an MU student organization. He spoke about the changing trends in education, with a focus on business education, around the world, particularly in the U.S. and in India. Vinze and three other speakers kicked off the festivities, drawing a crowd of about 40 people to Jesse Wrench Auditorium in Memorial Student Union on Saturday afternoon. India Day also incorporated a celebration of Indiaâs 69th Republic Day â" a Jan. 26 holiday that marks the day Indiaâs constitution took effect, establishing India as a republic. The event was free and open to the public, and by the time the musical and dance performances were scheduled to begin, many more people had gathered â" about 100 in total. Vinita Chandwani, president of Cultural Association of India, sai d the event is not just for students, but also for the larger Indian community in Columbia. Chandwani said India Day shows the diversity of India, citing different languages and dance forms native to the country. âIt reflects the colors of India because we have these cultural events,â she said. The featured speakers, all of whom were from India, touched on very different topics. Chandwani said speakers were encouraged to share their journeys and achievements because India Day is partially about the contributions Indian people have made to the community. Sudarshan Loyalka, a curatorâs professor in the Nuclear Science and Engineering Institute, discussed what particles are, the research he conducted on them and the impact his research has had. Shibu Jose, director of MUâs School of Natural Resources, spoke about his hopes to take the school to âeven greater heights.â Jose also talked about his collaborations with India: a project related to biomas s and biofuels, and an effort to protect wild tigers and their habitats. Trupti Joshi, director of Translational Bioinformatics at MUâs School of Medicine, gave the crowd a crash-course in bioinformatics, which is used when scientists are trying to collect or analyze large amounts of biological data. She said bioinformatics experts work to make tools that enhance research for people in fields like biology, medicine and plant science. âEssentially, I think of bioinformatics as an interdisciplinary field which really builds bridges between all of these departments,â Joshi said. Allison Coreggia, 22, said it was interesting to hear about how so many academic departments were interdisciplinary. Coreggia said she hadnât known about the speakers in advance, but that they were âa pleasant surpriseâ because of her interest in the sciences. âMany of (the speakers) all said how their fields intersected with different ones,â Coreggia said, pointing to e ducation as a crucial aspect of all the fields. Coreggia attended the event as part of the Sishu Vihar Kids group. The speakers and cultural performances also drew community members to the celebration. Gagneesh Rawat, 47, said his daughter was performing in the cultural half of the event and that he also enjoyed the speakers. âThree years back, it just used to be a cultural program where the kids would perform. It has evolved into more than just a cultural program,â Rawat said. The event used to be known as just a Republic Day celebration, he said. Spring 2018 public life reporter. I am a sophomore studying magazine journalism and political science. Follow Madison Czopek Your notification has been saved. There was a problem saving your notification. Whenever Madison Czopek posts new content, you'll get an email delivered to your inbox with a link.